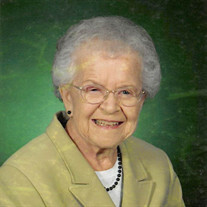 Mary Jo (Gentry) Youse, 90, of Hannibal, Mo. passed away at 10:25 p.m. Wednesday, January 25, 2017, at Luther Manor Retirement & Nursing Center. Funeral services in honor of Mrs. Youse will be held at 10:00 a.m. Monday, January 30, 2017, at the Smith Funeral Home & Chapel. Pastor Steve Barker will officiate. Burial will be in the Grand View Burial Park. Visitation will be held 2:00 to 4:00 p.m. Sunday, January 29, 2017 at the Smith Funeral Home & Chapel. Mary Jo was born on September 12, 1926, in Hannibal, Mo. the daughter of Malcolm S. and Josephine (Turner) Gentry. She was married to John T. Youse on June 6, 1948 at the First Christian Church in Hannibal. John preceded her in death on May 19, 2015. Survivors include three sons, John Gentry Youse and wife Janet, James Stephen Youse and wife Linda, and Thomas Turner Youse all of Hannibal, Mo; two daughters, Mary Ann McCarty of Hillsborough, NJ, and Julie Lynn King and husband Bill of Jackson, Mo; one brother, Malcolm Gentry of Hannibal, Mo; eight grandchildren, three great grandchildren and multiple nieces and nephews. Mrs. Youse was preceded in death by her parents and husband. Mary Jo graduated from Hannibal High School and went on to receive her Associates Degree from Christian College in Columbia, Mo. She went on to transfer to the University of Missouri and received a Bachelor's Degree in Education. Mary Jo had a strong will for her education, she later received a Master's Degree in Education from Truman State University in Kirksville, Mo. Along with helping raise her five children, Mrs. Gentry taught commercial subjects at Hannibal High School, English at Palmyra Jr. High School, and taught English at Hannibal Jr. High School. Mary Jo was a strong active member of the First Christian Church, where she had served as an Elder and past board member, member and past president of the Keystone Sunday School Class, member and past president of the Ruth CWF group, and past board member of Wee Care. Mrs. Youse was also active in the DAR, past regent and member volunteer of the Hannibal Regional Hospital Auxiliary, and past president the Mt. Zion Community Club. When not teaching or volunteering, Mary Jo loved spending time with her family. She enjoyed preparing for family gatherings, cooking, gardening, sewing, reading, traveling and playing bridge with her bridge group. Memorial contributions may be made to Luther Manor Retirement & Nursing Center or First Christian Church, in care of the Smith Funeral Home & Chapel.